Too much stress can be damaging to both you and the person for whom you are caring. The following stress indicators, experienced frequently or simultaneously, can lead to more serious health problems. Learn to recognize signs of stress in yourself. Taking care of yourself will help you be a better caregiver. It begins with something simple; one forgets the name of a daughter’s new husband or has trouble balancing the checkbook. Later, an everyday task may feel strange or the street coming home seems unfamiliar. Eventually there might be mood swings — from calm to tears to anger — for no apparent reason, and finally one seeks answers to the many unanswered questions. The warning signs often add up to Alzheimer’s disease (AD), a progressive, degenerative disease of the brain and the most common form of dementia. Approximately 4.5 million Americans have AD and an estimated 16 million will have AD by the middle of this century — 2050 — unless a cure or prevention is found. First described in 1906 by German physician Dr. Alois Alzheimer, the disease once considered rare is now the leading cause of dementia. Dementia — though often used synonymously with AD — is an umbrella term for several symptoms related to a decline in thinking skills. Common symptoms include a gradual loss of memory, problems with reasoning or judgment, disorientation, difficulty in learning, loss of language skills and a decline in the ability to perform routine tasks. Tina Stroud, president of the Alzheimer’s Association’s Big Sioux Chapter in Sioux City, says their primary role is to provide education support and advocacy on behalf of caregivers and the community. They accomplish that through a wide range of services and lots of education. Transitions also include education, from the young child who doesn’t know what is happening with a grandparent to adult children faced with choices and learning to deal with caregiver stress. In addition to support groups and in-home respite care, the Big Sioux Chapter also has partnered with a local writer for an Alzheimer’s book written exclusively for children. It’s all part of an ongoing effort, says Stroud, to plan along the way for how AD will impact relationships and lives. AD has a very gradual onset, and that’s where the difficulty is, Stroud says, with the disease and actual point of diagnosis. Debbie Bernstein LaCroix witnessed this progression as a teen-ager when her grandmother was diagnosed with AD. As an adult, Bernstein LaCroix struggled to remember things about her grandmother before the disease had taken hold. After the birth of her son, Bernstein LaCroix suddenly realized how she could make that happen — if not for herself, for others. 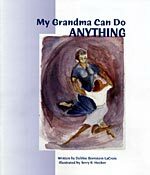 The result was Bernstein LaCroix’s first book “My Grandma Can Do Anything,” an illustrated story for children that captures and explains the different stages of the disease. In conjunction with the Alzheimer’s Big Sioux Chapter, Bernstein LaCroix wrote the story while Terri Hecker of California penned the illustrations. The last page contains a journal that children can fill out to keep track of special memories. In addition to their continuing education, the Alzheimer’s Association has a resource library, a 24-hour helpline, a family assistance program and works to address other disorders that also cause dementia. A common cause of dementia in the elderly, MID occurs when blood clots block small blood vessels in the brain and destroy brain tissue. Others include fronto-temporal dementia, dementia with Lewy bodies, Parkinson’s disease, Creutzfeldt-Jakob disease and Huntington’s disease. Similar to AD, all these disorders involve disease processes that eventually destroy brain cells. Ellen Nichols of Dakota Dunes began noticing symptoms in her father a few years ago when he became more forgetful and asked the same questions over and over. The difference, Nichols says, is that her father knows that he has it, he knows it is something you die from and he’s going to know during the process what is going on. “The doctor said that in a way, it’s going to be more difficult than if he actually had Alzheimer’s because people with Alzheimer’s generally don’t know they have it,” she says. Nichols, who is married with two small children and is expecting her third child in January, is in the process of moving her father into the suite she and her husband built onto their home. Nichols has spent the last two years preparing for the move and setting up a support system to manage caregiver stress. She hopes to keep her father in the family environment as long as his condition allows. Nichols arranged for two girls to come to her home at scheduled times throughout the week, and also hired a cleaning woman so she could get her needed rest. But, she says, these things cost money. Nichols is not alone. More than seven of 10 people with AD live at home, and family and friends provide almost 75 percent of home care. The remainder is “paid” care costing an average of $12,500 per year, with families paying that almost entirely out-of- pocket. Neither Medicare nor most private health insurance covers the long-term care most patients need. Nichols credits the Alzheimer’s Big Sioux Chapter for steering her to resources and directing her to other agencies. They also help dispel the myths behind the disorders, which Nichols says is so important. For More Information visit the National Alzheimer’s Association’s website at www.alz.org or the Big Sioux Chapter at www.alz-sioux.org or call 800-426-6512.